Note: this is an add-on. You must have at least PrivateContent v6 to use it. User Data add-on boosts your PrivateContent plugin allowing you to create and use unlimited fields to record more informations from your users. A powerful but yet simple wizard will guide you creating them. Then, will be automatically integrated in the PrivateContent engine and ready to be used in registration or custom forms. Each field is dynamically validated and is also really flexible, letting you target what will be required. String length, numeric ranges, multi-option checks, preset texts (integer and floating mubers, e-mail address, dates, url, etc) and also room to use advanced regex. Say goodbye fake data stored! Datepicker comes along date fields and is also possible to use placeholders for textual fields. Finally custom fields can be added in users list and you can obviously sort and search users by them. Giving you the best overview possible to work better and faster! 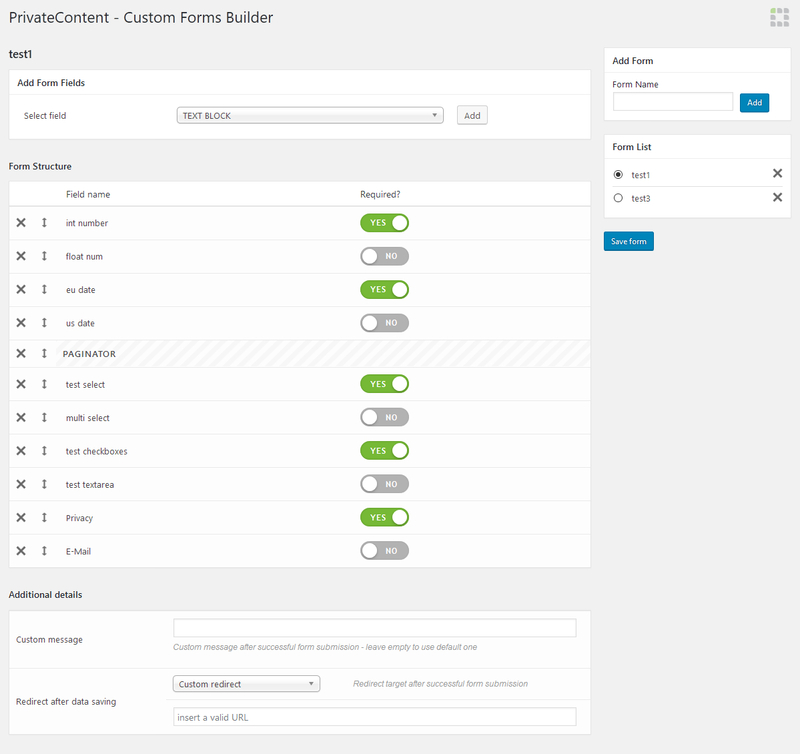 User Data add-on gives you also the ability to create custom forms to let users edit their data autonomously. Yes, also password can be changed! Doing that is super simple: just create a new form, insert fields you prefer and eventually set which ones to be required. Obviously also default PrivateContent fields can be included. Plus you can also set a redirect once form has been fulfilled. As extra feature, owning Mail Actions add-on, an admin notification can be sent once an user submits a custom form. Useful for example to know when data is changed or an user is active. Sometimes you may need to require users to reset their password, for security or privacy reasons. The add-on allows you to do this manually, during import or also after a password recovery! 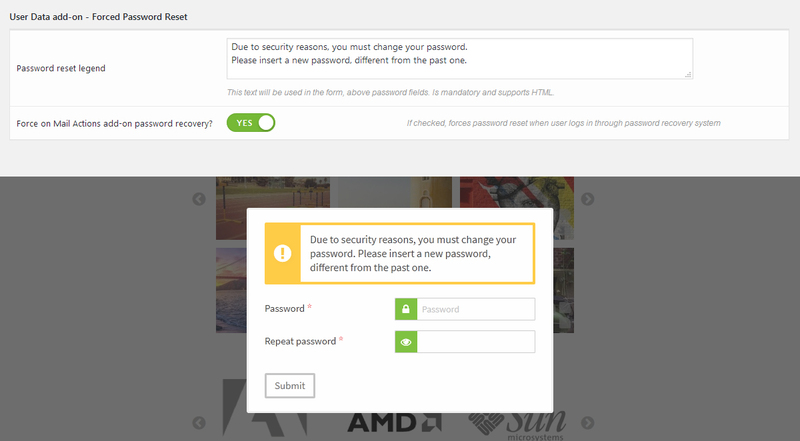 As soon as users login, they will be prompted by a persistent lightbox and won’t be able to navigate until they reset their password. 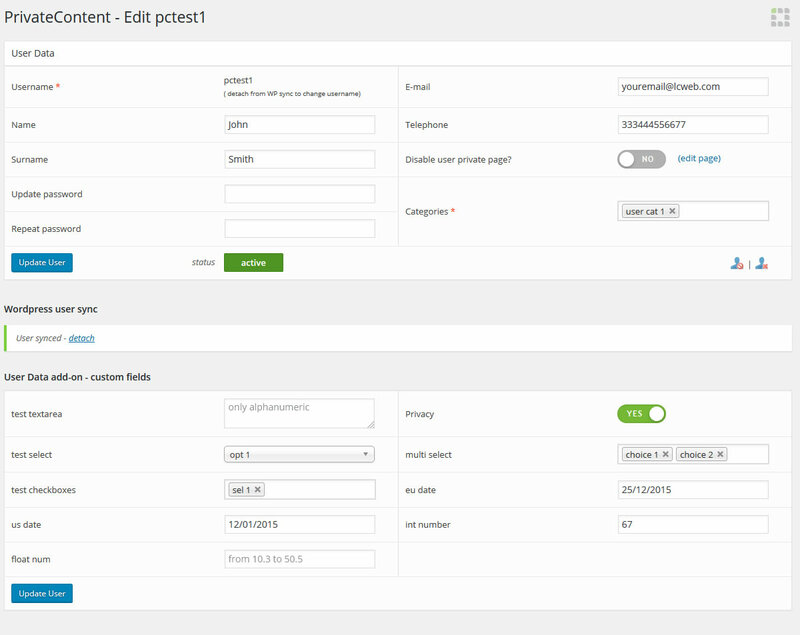 PrivateContent gets once more flexible with import support for custom fields. Procedure can’t be easier: starting from standard CSV file you’d use for standard import, you’ll add just fields you want to import. Wizard automatically tells you which CSV column needs to match selected fields. Data will be validated and automatically saved. 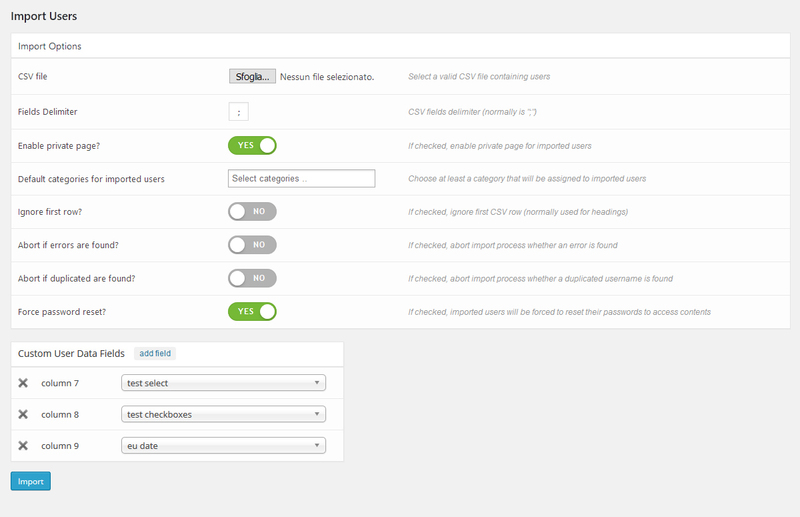 Of course you can manage any new data collected in PrivateContent admin panel. 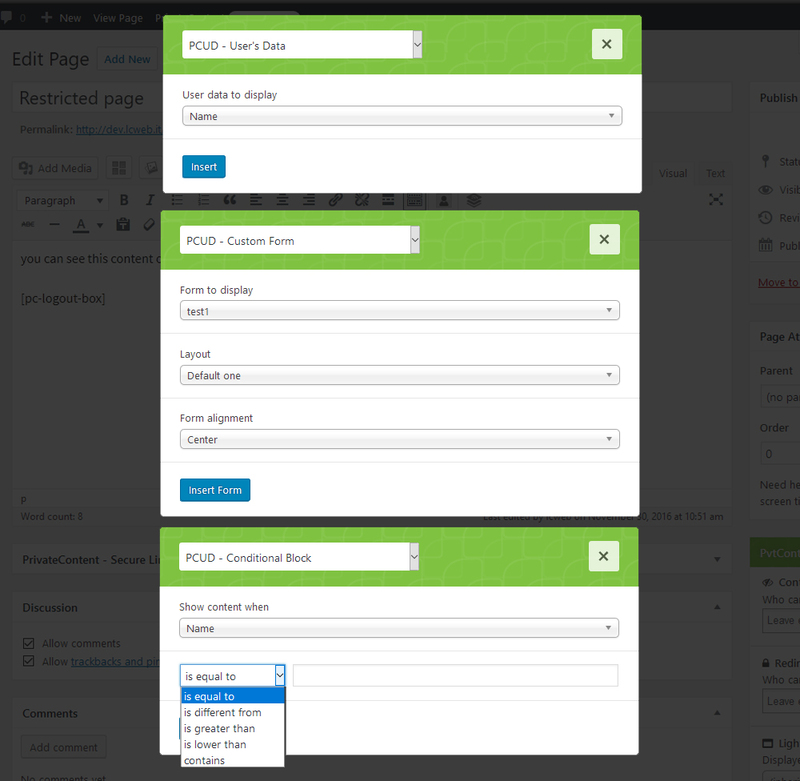 Editing an user an additional interface will show new fields and you’ll be free to manage them. Finally, export everything: User Data extends PrivateContent exporting system including every custom fields for each user. Creating complex users database has never been so easy! Need one more way to restrict things in pages? With this shortcode you can hide/show contents basing on data stored for each user. Everything is about conditions: contents will be shown is user’s data will be: equal, different, bigger, lower than value set. Finally “contains” option, to search occurrences in data. But how does it work precisely? Let’s make a quick example, suppose you want to create create two hidden blocks: one show contents to user having username = test1 and the other one to user containing “test” string in username. Give a try logging in and discover how easy is to create complex patterns! Simplest way to display info stored in database is using an User Data shortcode! Once logged, users will see their data as plain text. It’s a great way to create welcome messages or print summary diagrams. Check it on live demo!